Place beans, reserved bean liquid, lemon juice, sesame seed, garlic and salt in blender or food processor. Cover and blend on high speed, stopping blender occasionally to scrape sides if necessary, until uniform consistency. Spoon dip into serving dish. Sprinkle with parsley. Serve with pita bread wedges. This great-tasting cocktail dip began to show up at parties in the 1970s, perhaps spurred by the growing vegetarian movement or by American travels to the Middle East. Serve this melt-in-your-mouth dip like they do in Turkey. Make an indent in the middle of the bowl of hummus, and spoon in 1 to 2 tablespoons of olive oil. Gravy and stuffing and pies, oh my! Don't let heavy foods wreck your waistline this holiday season. Oftentimes at holiday parties, it's not the main courses that later leave you in a food coma, it's all those calorie-rich appetizers you gorge on while waiting for your ham and mashed potatoes. Nip this problem in the bud by choosing healthy snacking options for you and your guests. Today we have an ample array of snacks available, so you're not confined to rice cakes just because you want to forgo chips. Brands like Food Should Taste Good offer everyone's favorite munchies, but without trans fat, cholesterol, genetically modified ingredients or high sodium content. Better yet, you can choose seasonal Sweet Potato Chips over regular varieties. Chip or vegetable dips that are made mostly of sour cream or cream cheese can pack some major calories. 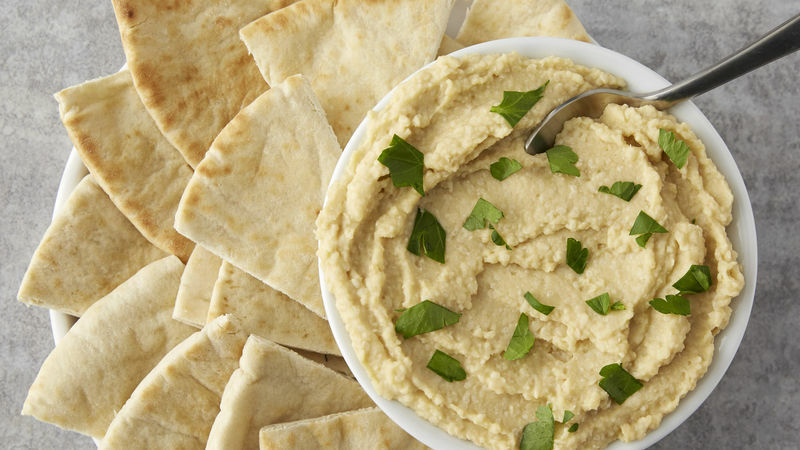 Instead of these dairy-heavy apps, choose a healthy Hummus or Black Bean Dip. These options are not only lower in fat, but they also contain fiber, meaning you and your guests may be less likely to over-indulge at dinner. Fruit is both satisfying and refreshing, so don't overlook it as a great app to serve. These Fruit Kabobs with Pineapple Dip are a pretty addition to any food table, and Prosciutto-Wrapped Fruit is a little salty, a little sweet and a lot satisfying. While nuts get a bad reputation for their high fat content, it's somewhat undeserved, considering that the fats they contain are usually the healthy kind and the crunchy snacks pack a ton of vitamins and minerals. Instead of serving plain ol' salted varieties, consider making these amped up Honey-Cardamom Mixed Nuts – and feel free to replace the butter with healthier olive oil. Seafood like oysters, mussels and shrimp are rich in protein and minerals, not to mention they'll make you look super classy for serving them. Oysters on the half shell with some lemon and cocktail sauce on a bed of ice or a steaming pot of mussels served alongside crusty, grilled bread will make everyone swoon before digging in. If you want to get a little more creative, try this Ceviche-Style Shrimp Cocktail or Sriracha Shrimp Cocktail for a spicy twist on the diner classic.